I can't imagine what God felt like to realize that he was born to die. We are all born to die, but to know that you will die tragically for a crime you didn't commit...that's hard. His death had a purpose. His pain was not in vain. His life was a ministry. Many of us don't understand why our paths have taken us through the valley instead of the mountaintop. We don't understand our pain. We don't know why we hurt or why we hurt others. Life seems like there is no rhyme or reason. 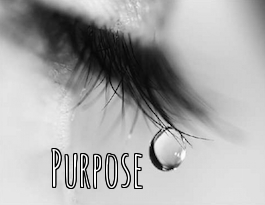 There is a purpose in every tear, in every misstep, in every mistake, and in every regret. There is a lesson in your heartache. There is a seed of maturity in the soil of your doubts and fears. There is a ministry in your series of unfortunate events. There is life in your spiritual death. There is purpose in your pain.